The Kalorik Stainless Steel 8 Qt. Digital Slow Cooker does all of the cooking for you its as easy as adding your ingredients, adjusting the settings, and pushing the start button! Create anything from hearty soups and stews to burritos, pasta dishes, roasts, and chili. Use the slow cookers Low setting when you want to slowly simmer foods throughout the course of the day or use its High setting when you want to cook a dish closer to meal time. After your food finishes cooking, keep it warm for hours by using the Keep Warm setting. The unit features a removable, ceramic cooking pot that holds up to 8 qts. (7.6 L) of food or liquids and cool-touch handles that allow for easy transport. The tempered glass lid features a silicone rim for a snug fit and a locking mechanism that guards against spills and spattering. Chromed panel frame. The units chrome-plated control panel allows you to adjust cooking times, set cooking speeds, and delay cooking with a programmable timer. Brushed stainless steel housing. The brushed stainless steel finish and simple design will add modern flair to your kitchen and stand out at parties, gatherings, and events! Releasing heat and moisture from your meals when you lift slow cooker lids will now be a thing of the past. This convenient stirring mechanism will ensure even heat while cooking food and scrapes the side of the slow cooker to ensure no hard build of food up or film on top. A timeless stainless steel design, perfect accent to any modern kitchen. This innovative and unique product is truly convenient, it will automatically stir your food using a special stirring system with mixing paddles. Enjoy healthy, home-cooked meals even with a busy schedule thanks to this easy-to-use oval-shaped slow cooker. With its generous 4.5-quart capacity, the unit works great for cooking up soups, casseroles, pot roasts, curries, and more. Simply add ingredients to the unit's stoneware crock, insert it in the cooker, and turn the temperature-control dial from off to keep warm, low, or high. The slow cooker's see-through glass lid, with a stainless-steel rim and stay-cool knob, traps in heat and moisture and allows for checking on food at a glance. For added versatility, the removable crock doubles as a serving dish and can go in the refrigerator to store leftovers or into the dishwasher, along with the lid, for quick cleanup. Integrated stay-cool handles provide safe transport. And for your convenience, a 3-cup sauce dipper is included, that will keep your sauces warm while serving, and that can also be used to melt chocolate effortlessly for pastry making or delicious chocolate fondues. Enjoy healthy, home-cooked meals even with a busy schedule thanks to this easy-to-use oval-shaped slow cooker. With its generous 6.1-quart capacity, the unit works great for cooking up soups, casseroles, pot roasts, curries, and more. Simply add ingredients to the unit's stoneware crock, insert it in the cooker, and turn the temperature-control dial from off to keep warm, low, or high. The slow cooker's see-through glass lid, with a stainless-steel rim and stay-cool knob, traps in heat and moisture and allows for checking on food at a glance. For added versatility, the removable crock doubles as a serving dish and can go in the refrigerator to store leftovers or into the dishwasher, along with the lid, for quick cleanup. Integrated stay-cool handles provide safe transport. This Architect<sup></sup> Series II 30-inch warming drawer gives you the versatility of an oven, bread maker, and slow cooker in one integrated space. Warm multiple dishes at the same time, proof bread, or slow cook beef and poultry. Custom-control technology allows you to use the drawer for various tasks with mouthwatering results. 8L Digital Slow Cooker with Locking Lid in Stainless Steel The Kalorik Stainless Steel 8 Qt. Digital Slow Cooker does all of the cooking for you its as easy as adding your ingredients, adjusting the settings, and pushing the start button! Create anything from hearty soups and stews to burritos, pasta dishes, roasts, and chili. Use the slow cookers Low setting when you want to slowly simmer foods throughout the course of the day or use its High setting when you want to cook a dish closer to meal time. After your food finishes cooking, keep it warm for hours by using the Keep Warm setting. The unit features a removable, ceramic cooking pot that holds up to 8 qts. (7.6 L) of food or liquids and cool-touch handles that allow for easy transport. The tempered glass lid features a silicone rim for a snug fit and a locking mechanism that guards against spills and spattering. 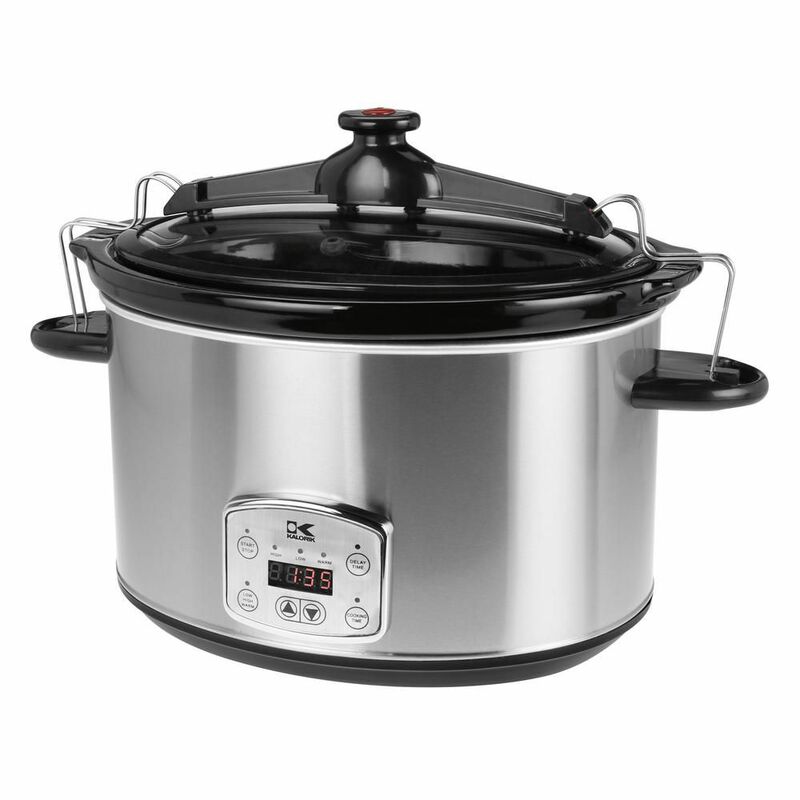 8L Digital Slow Cooker with Locking Lid in Stainless Steel is rated 5.0 out of 5 by 2. Rated 5 out of 5 by Saminy from Works just fine. ... Works just fine.